very quick results: the online pre-recruitment field is doable in 24h + the phone selection in 48h. a very fine analysis : the online pre-recruitment survey is analysed prior to the groups, offering a first overview of the study’s results which enable us to better prepare the moderation. The online quali (Bulletin Board) is an online qualitative study carried out on a long period of time for very rich results. It enables us to gather together on an online plateform 15 to 30 participants for a duration of 1 week to 1 month, or even more. Flexibility in time and location : high participation rates, even with low incidence or otherwise hard-to-reach consumers..
An individual AND collective dynamic : the respondent is given access to the other participants’ answers after he or she answers them. A transcription of the data into Word, Excel, etc. A sufficiently open system to let respondents express their views without being overly influenced. Quali-quanti® Studies are adapted to various administration modes : face to face, telephone, online, self-administred, and online. Longitudinal studies are multi-phases QualiQuanti Studies with take place on long periods of time. They are particularly adapted to product and services tests. The SpeedBack® method enables our clients to have a compelte feedback on a study in a very short delay with having to resort to a heavier study. At QualiQuanti, we frequently use semiological analysis in our studies. Semiotic analysis is the identification and description of each element of a product or a communication. 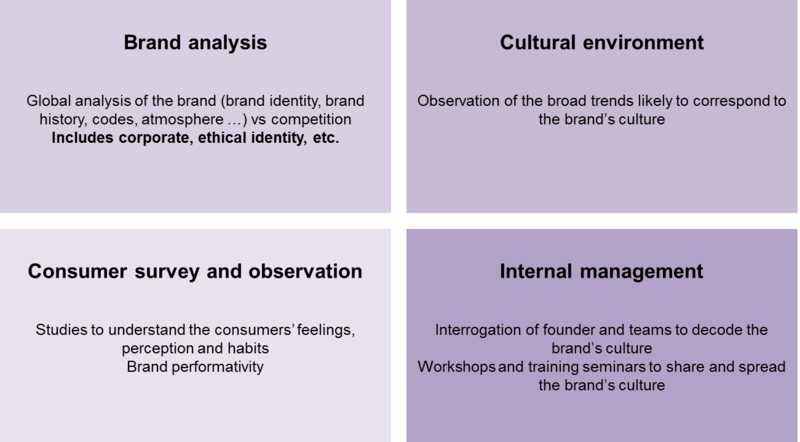 QualiQuanti semiotic studies review both textual and visual elements to better help identify a brand or corporate strengths and weaknesses, notably compared to other brands and businesses of the industry. Semiological analysis are led by high level semioticians during 3 to 6 hours cessions. At QualiQuanti, semiotic analysis can be used alone or combined with qualitative studies : they are then meant to enrich the consumer’s perception. Interactive, giving immediate an response to your business issue. The Semio-live® study allows clients to get immediate actionable solutions to their business issues or work hypotheses. The semiotician reviews the material you provided him (marketing supports, concepts, strategies, etc.) throughout the whole live analysis. Budget-friendly, with limited costs and time saved. Provided that the marketing (or advertising) material is ready to be analyzed, a Semio-live® study can be set up very quickly, and provides instant results at a limited cost. The Semio-live® session can be supplemented with further analysis if needed. Creative, thanks to a solutions-oriented session. A Semio-live® analysis is a collaborative session. As many participants (both on the research- and client-side) attend the session, the content is submitted to the analysis of many. Thus, the Semio-live® study can become a creative brainstorm leading to new ideas for future marketing campaigns and product development. Educational, thanks to a great integration of the results. Participating in the live session allows marketers to follow each stage of the analysis in real time, and hear the semiotician’s comments while they visualize the key elements. This part is critical for marketers to get a deeper understanding of the results, and integrate them more easily in their strategy. Thanks to our experience in building panels, QualiQuanti has developed a flexible, efficient and cost-effective solution to enable brands and corporate to manage their own online panel..
Pour toute demande d’information, vous pouvez nous contacter via ce formulaire en ligne, nous vous répondrons dans les meilleurs délais.